The Packexe Carpet Protection Film is available in two different size rolls. 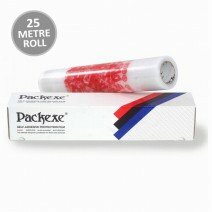 Choose from either a 25 metre roll for small jobs or the 100 metre roll for larger areas. Simply stick over the top of your existing floor covering or new carpet tiles to protect while other tradesmen finish off or for decorating and refurbishment work to be completed. Easy to lift and dispose of, leaves no sticky residue behind. Protects your floor from dust and debris brought in on dirty work boots or shoes. It also protects against wet muddy feet, any spills can be quickly wiped leaving no mess. This ingenious product is great when stuck to stairs and is much safer than using old dust sheets. To find out more about this product and to watch videos on how to apply, just click on 'More Details' below. This carpet protection film from Packexe provides the ultimate solution for your floor. Protects against dirt, dust, moisture, debris, mud and spills in all manner of situations. From re-decorating jobs to refurbishment work just simply lay this film over your carpet while repairs are being carried out and watch while this carpet protection film covers against them all. Made from a top brand name manufacturer and even seen on several TV DIY programmes, the uses and benefits for the product are endless. Once applied to your floor it does not ruck or split but when ready to take up again does so cleanly without leaving any sticky residue on your carpet. Over the years we’ve seen this used for several different applications. On wet days it can be used in a caravan or motor-home to stop mud from being brought in from the outside, always keeping your carpet in perfect condition. If you are looking to re-decorate in a room or office that already has carpet laid then this saves you from any spills or drips which would otherwise normally happen. Unlike using old dust sheets or plastic sheeting, the film with adhesive on the back, grabs the carpet and stays where it’s put but comes up cleanly at a later date ensuring safety for a low price. Packexe colour code their protection film depending on use, but the red type which we stock, is for use on any carpeted surface. Although we do not stock the dispensers shown in some of the product videos, it can still be simply applied to the floor with the minimum of fuss and hassle. It even goes up stairs which in the past would normally be left uncovered. However if you ever were to put dust sheets or cloths up a set of stairs then this could create a potential trip hazard which would be extremely dangerous. This protection film just follows the natural shape of the tread and riser and means no more worrying that someone is going to fall. You then have the added peace of mind that you are protected against moisture and filth leaving the film to be easily removed and binned afterwards. We stock this film in two different lengths, a 25 metre and a 100 metre. The width of each roll is 625mm which is just right when applying this product to your floor. For this product to work correctly it must be adhered to a carpet pile surface, as the special low tack adhesive needs to grab the pile to guarantee proper adhesion. You never have to worry about anyone making a mess again while this product is covering the floor. It lifts and peels off the carpet leaving it clean and immaculate with no hint of stickiness. You’ll wonder why you’ve never tried this before after using for the first time. The protection film can be ordered separately or with your order of carpet tiles and accessories and delivered straight to your door. It comes neatly wrapped and ready to use, we can even ship next day as we have this film in stock in our warehouse. There have been many occasions in the past where this protection film has proved to be invaluable. On new builds or offices where replacement carpet tiles have been laid, this product is put down to protect against errant grime, dirt, dust and wet feet where electrical work or extra tradesmen need to finish off. Even in shops where the installation of display equipment needs to be put in over the top of new flooring. The carpet protection film always ensures you have a floor that looks brand new, even after the work and contractors have long been forgotten.